Do you dislike drinking a plane and nasty tasting tap water from the faucet. I do!! But drinking water is something we can't avoid. It has a lot of health benefits and it does a lot of great things to our body. I try drinking maybe four to five glasses a day but I also drink other stuffs like juice or coffee. The problem I have is that our water doesn't taste right so I sometimes dislike drinking water unless if it's flavored or if it's coffee or chocolate milk. You can see my dilemma, I am trying to lose weight by cutting back drinking sweet beverages but I despise drinking water more than I could take. Where we live has a hard water that's why we installed water softener on our water system. But It doesn't make our water taste any better. I have heard people talking about water infusion and I had no clue what it meant. Until, FlavFusion sent me a free sample of their water bottle infuser for review. Now, it all made sense. I can make my very own naturally flavored water by adding my favorite sliced fruits. Then I'll get to enjoy drinking more water with no added artificial sugar or flavoring. How brilliant. 1. Basket- where you put your sliced fruits. 2. 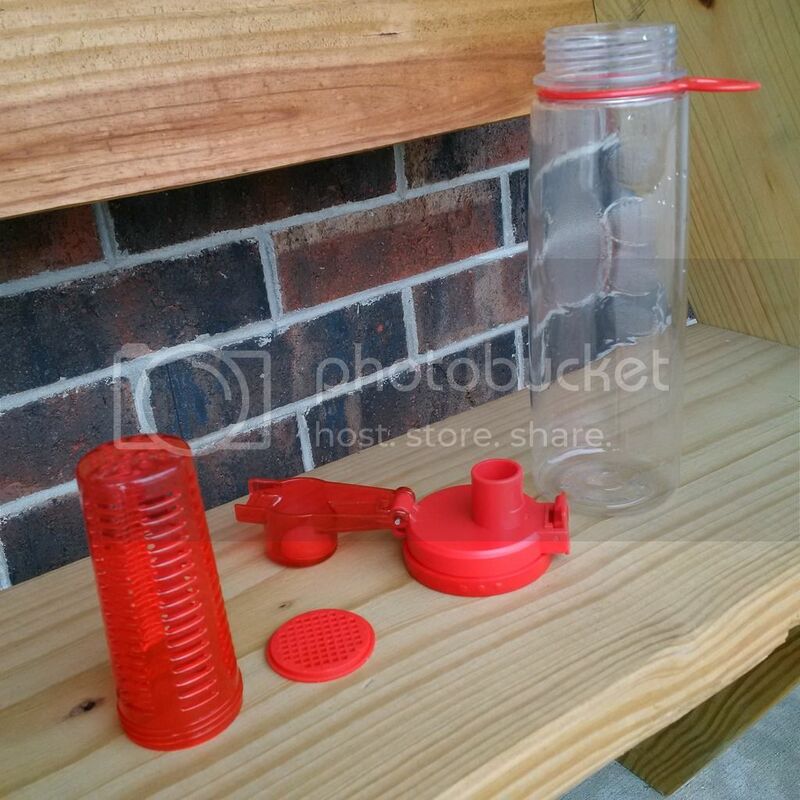 Filter - it filters fruit seeds and fruit chunk before the water goes into the sipper. 3. Locking Flip Top Sipper Lid- where you drink and also easily refill your bottle. 4. 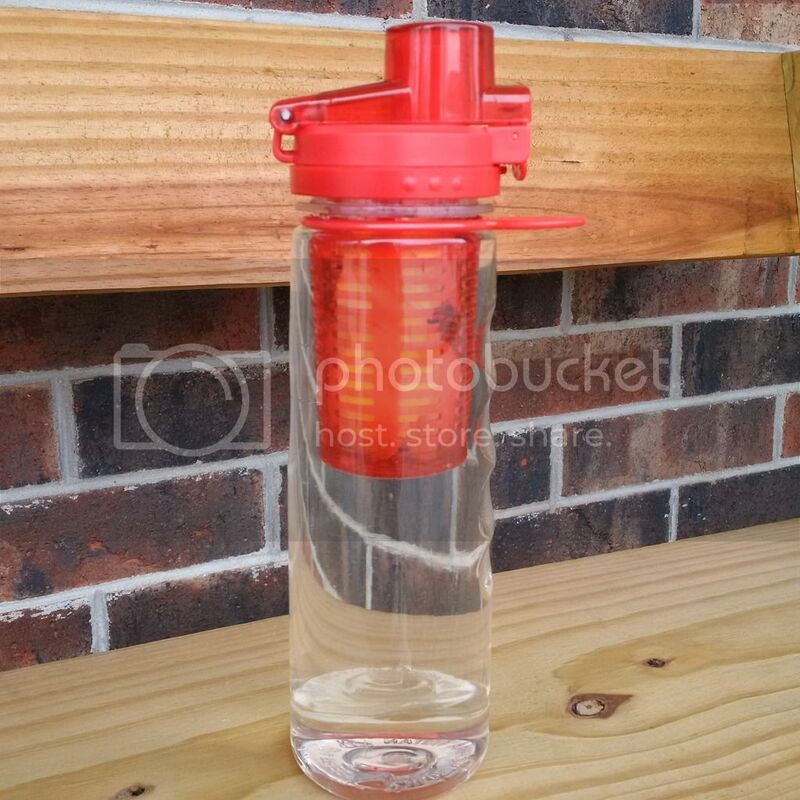 Bottle- 25 oz BPA free and made of Tritan plastic. This is my very first Infuser water bottle, so I can't compare it to other brands. But one thing I could tell you is that I am very impressed with it and I love it. I take it to work everyday and I don't run out of water fast because of how much water I can take in this container. I can say that this product is durable. The bottle itself although made from plastic, but feels thick and strong yet light weight. Not just an ordinary plastic because it's made from Tritan and its BPA and Lead free according to the manufacturer. I have never drop this bottle, it has a no slip grip design on the outside preventing from slipping off your fingers and I can carry it with just one finger as well because of the hook attached to it. What I love the most is the locking flip top sipper. I never had to worry about spills or leak. In fact I carry this infuser inside my purse and it's laying sideways but yet no spills. I don't worry about it getting unlock because it doesn't get unlock easily. The whole thing is easy to wash because all parts can be taken apart. The basket where my sliced fruit/s is placed allows the water to flow giving a nice sweet natural fruity flavor to my water. The filter does a great job separating the seeds and fruit chunks from the water so I won't swallow any of them. I really enjoyed drinking water now, I experimented with different fruits but strawberry is my favorite so far. Like I said I am very impressed with this product and use it every single day. If you want more information or want to place an order visit their Amazon link below. Disclosure: I received a 25 oz Infuser water bottle for FREE from FlavFusion for product evaluation purposes. However all opinions expressed were mine and not influenced by any means.